What do mothers want and need from their parenting partners, their extended families, their friends, colleagues, and communities? And what can mental health professionals do to help them meet their daunting responsibilities in the contemporary world? The talented contributors to What Do Mothers Want? address these questions from perspectives that encompass differences in marital status, parental status, gender, and sexual orientation. Traversing the biological, psychological, cultural, and economic dimensions of mothering, they provide a compelling brief on the perplexing choices confronting mothers in the contemporary world. Of course, mothers most basically want their children to be safe and healthy. But to this end they want and need many things: caring partners, intergenerational and community support, a responsive workplace, public services, and opportunities to share their experiences with other mothers. And they want their feelings and actions as mothers to be understood and accepted by those around them and by society at large. The role of psychotherapy in reaching these latter goals is taken up by many of the contributors. 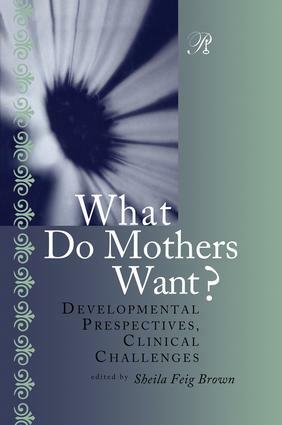 They reflect on the special psychological challenges of pregnancy, birth, and the arrival of a newborn into a couple’s (whether hetero- or homosexual) life, and they address new venues of therapeutic assistance, such as brief low-cost therapy for at-risk mothers and infants and group interventions to help couples grow into the new role of parental couples. "What Do Mothers Want? is written for our profession. It belongs in courses on feminism. It is theoretically sophisticated enough and clinically applicable enough to be worthwhile for anyone's study of what it means to be a woman."